Do you feel that the Christmas wreaths which you make are extra special? for the world and his auntie to admire? Then enter our competition! Entries must be with us by Friday 14th December 2018. See Rules and Conditions below. By entering the competition, competitors agree to be bound by the rules and conditions of entry, The decision of The Paper Studio in all matters relating to this competition is final and binding. No communication will be entered into. Winning a Prize is contingent upon fulfilling all requirements set forth here. The closing date for entries is 12 midnight on Sunday 25th November 2018. All submissions must be made online. Email submissions (or use the We Transfer service for large files) to design@thepaperstudio.co.uk, adding your name, business name, postal address and a contact telephone number. There is no charge for entry. Up to 3 entries are allowed per person, however only one £15 voucher will be awarded per entrant. Only one voucher will be redeemed per business. The Paper Studio is not responsible for lost, late, incomplete, invalid, unintelligible or misdirected registrations or entries, which will be disqualified. Proof of sending will not be accepted as proof of receipt. Photographs entered for consideration must be of high resolution suitable for litho printing, must show the Christmas wreath in place on a door and be in portrait format. Photographs which do not meet this specification may not be considered. 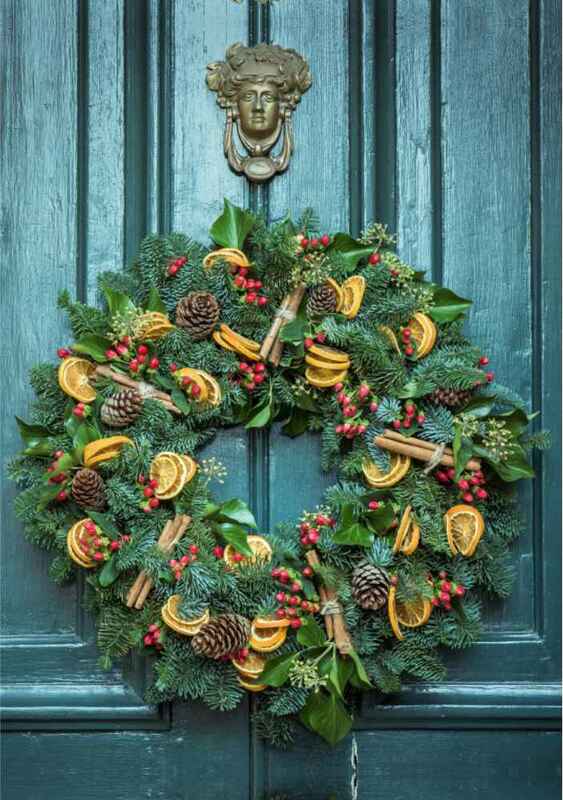 Please bear in mind that we will be judging the whole photograph for suitability as a card and therefore the door on which you choose to hang your wreath will be important in the judging process. The Christmas wreath in your photograph must be your original creative work, and you hereby warrant and represent that you are the sole and exclusive owner of all right, title, and interest in and to the Idea. You are prohibited from submitting any photograph that has previously been produced, sold, or optioned by or to anyone, at any time, and you warrant and represent that the Idea has never been produced, sold, or optioned by anyone at any time. You must currently hold the copyright in the photograph submitted and warrant that this is so. By entering your photograph you are explicitly giving The Paper Studio unlimited licence to reproduce it for the purposes of publicity and promotion and, if chosen as a winner, to publish as a card. Copyright in the photograph submitted passes to The Paper Studio. Copyright in the design of the wreath remains with the copyright holder. The winning entrants will be selected from among the photographs submitted based upon the level of creativity, originality, and suitability for reproduction as a folded bouquet card, as determined in the sole discretion of The Paper Studio. Enquiries concerning Entries will not be accepted. The Paper Studio may cancel or amend the competition, competition information, or these terms and conditions without prior notice. Any changes will be posted on our website.